Following are the results from the double event held at Partridge Run on January 10th. 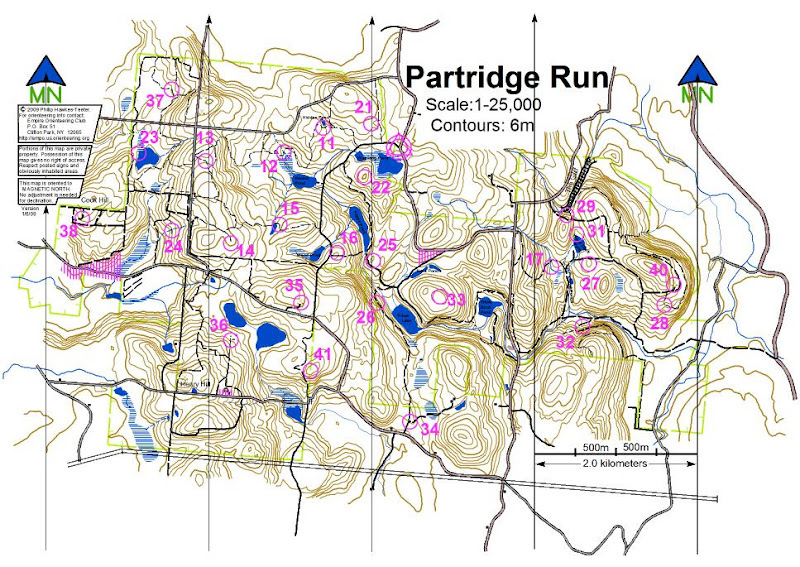 Both types of entrants (Ski-O and Snowgaine) are listed together, because there was no difference in the courses. Almost all those who used skis entered the Ski-O, and so the Snowgainers were on snowshoes or just boots (except Tori & Katie). If I have listed anyone's equipment choice incorrectly, let me know and I'll fix it. For Empire State Games purposes, those competing in the Ski-O who achieved a score of 50 or above get credit for successfully completing the course. Those who did not end up with 50 points get credit for entering a race. I believe I got everyone's ESG Class choice correct, but if there are errors, contact me so that it can be corrected soon, rather than at the end of the season when the "Qualified" list is being determined. * While under the 3 hour limit, the entrant finished 0:50 after the 3:00pm cut-off, thus having points deducted. **25 minutes over the 3:00pm cut-off, thus having 25 controls deducted. Check your map (or click on the icon to the left) to see how they went. (Having some extras, course maps are for sale at $5.) I find the results interesting in terms of how one might have best negotiated these conditions, which were certainly sub-optimal. Having learned a lot about the conditions while setting the courses, I likely would have chosen "boots" as the equipment du jour. But, it's clear to me that those who can ski a lot faster and through more variable terrain than I can, could do better on skis. I wish the weather would have changed one day earlier, as the skiing on Sunday was great (though, of course, the downed trees were/are still there). But, you can't out-guess the weather several months in advance; and all things considered, I consider this event to have been a great success. Thanks to all who came, and all who helped out (most notably Marty, who both helped with the map, and hung many controls). And to those who missed it, well, better next season.